Science has helped in solving problems and making decisions in different areas of life. Many of the major encounters and prospects that challenge our world need to be approached from a scientific perspective, taking into account societal and virtuous considerations. By studying science, one can develop an understanding of the world and learn that science involves certain processes and different ways of evolving and organizing information. Science can be used in different sectors to get robust solution for every problem. JIS University is known for its best science college in Kolkata and develops habits and capacity for self-directed learning. The college ensures that the students develop professional skills in technical knowledge, observation, documentation, and analysis. With a robust team of professors, we believe in providing elevated quality of teaching to nurture the curious minds. Our state-of-the-art research facilities provide the students with the best knowledge so that they can become sufficiently proficient to easily face global challenges. There is a vast scope in the field of science due to the advancements taking place in this field. Due to the immense scope, one can get a job in different kinds of the fields such as medicine, pharmacy, dairy, clinical research, agriculture, industry etc.. 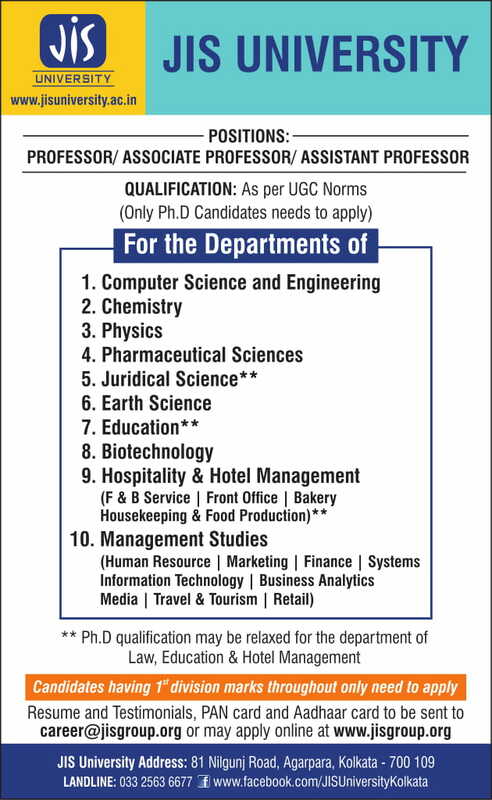 The university offers 12 courses which include department of B. Sc. in Physics, M. Sc. in Physics, Ph.D. Physics, B. Sc. in Chemistry, M. Sc. in Chemistry, Ph.D. Chemistry, Ph.D. Mathematics, B. Sc. in Geology, M. Sc in Applied Geology, Ph. D. Earth Sciences, B.Sc. in Microbiology and M.Sc. in Microbiology. Best B. Sc. colleges in Kolkata of JIS University ensures academic flexibility and there is a good faculty and student interaction. The project work and the seminar presentation are introduced in different courses to get an overview of the ongoing research and recent development in the subject. The University always encourages skill development among the students to stimulate entrepreneurship, employability, and self-employment in them.